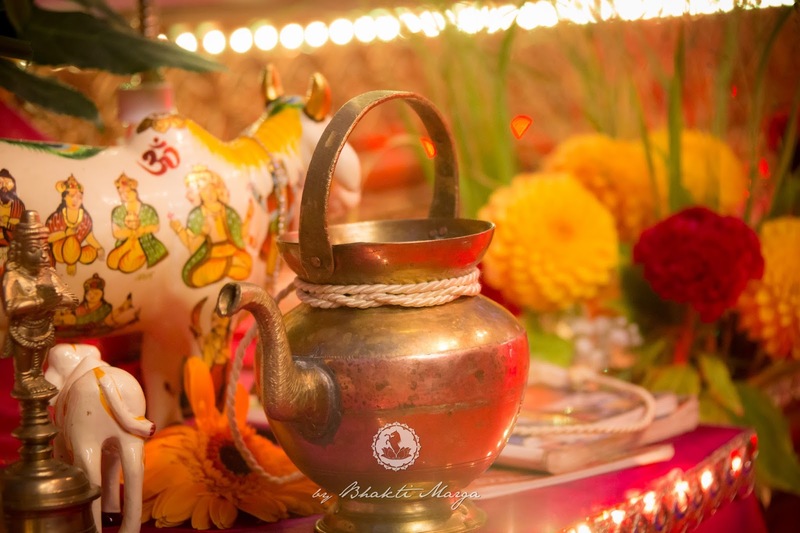 Skanda Mata means ‘the mother of Skanda’. ‘Skanda’ is a name for Kartikeya, or Muruga, who is the son of Shiva, while ‘Mata’ means ‘mother’. She has four arms and is seen holding Skanda with one arm in Her lap. The upper two arms are holding lotus flowers, while the fourth arm is displaying the Abhaya mudra. The Abhaya mudra represents fearlessness, and is used to bestow blessings such as protection, peace, and courage. 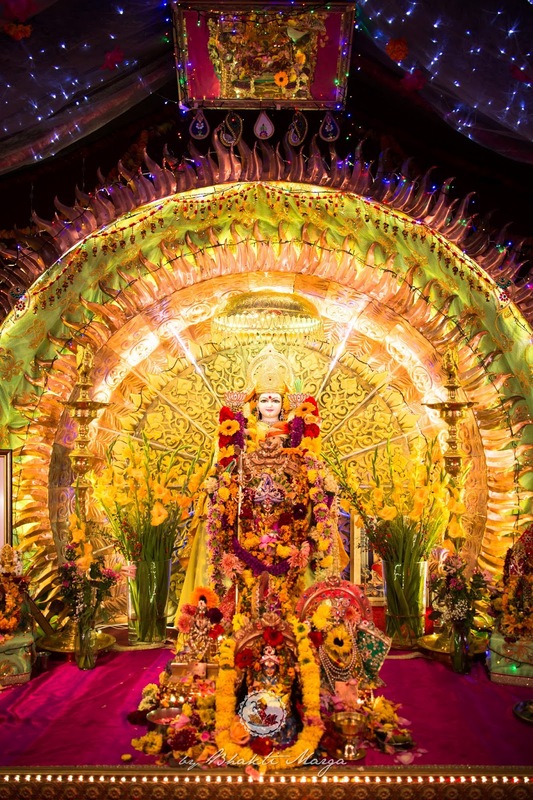 By worshipping Skanda Mata, one also receives the blessing from Kartikeya, who is the commander of the celestial armies. By having Skanda on Her lap, the Devi is showing that She is the Mother of all power and of all forces. She gives the power to vanquish negativity. Holding Skanda, She shows that the Divine Mother always holds onto Her children, whether they are conscious of it or not. 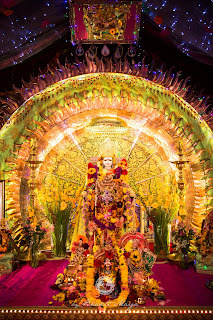 The fifth night of Navaratri was characterized by the enthusiasm of all who participated. 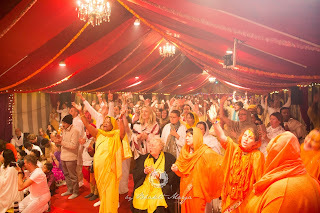 Because it was a Saturday night, more devotees were able to come and be part of the ceremonies and festivities in the Tent and in the Light Hall. The night included Guru Puja, Devi Puja, yagna and more. 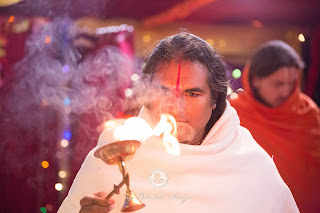 After the yagna, Sri Swami Vishwananda graciously walked through the main pathway, and distributed blessed water to everybody. Later in the evening, Sri Swami Vishwananda sang a number of joyful bhajans that lifted the energy of the devotees singing along. The bhajans legitimately rocked last night! Even walking through the Light Hall inside Shree Peetha Nilaya, you could hear people singing and clapping with the livestream footage. The night ended with a party of Dandiya dancing (stick dancing). People were dancing from the back of the tent to the front – an exhilarating night! 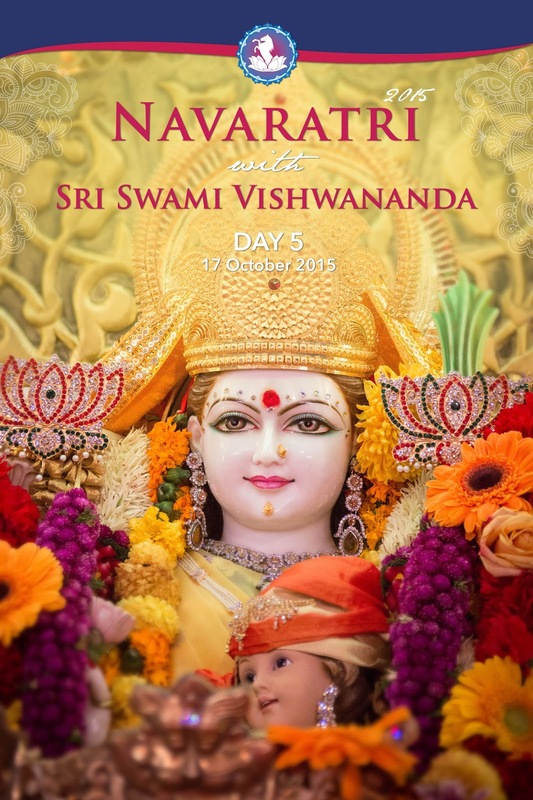 Today we celebrate the fifth Day of Navaratri, dedicated to Skanda Mata. 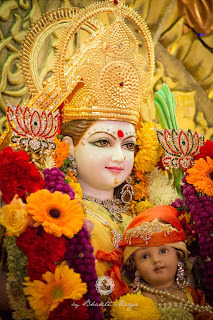 The baby that she holds represents not only Skanda, but all humanity. She is Jagad Janani. 'Janani' means 'sweet mother'. Here Maha Bhagavati took this form to remind us that everyone is Her child and all are Her creation. If you are in tune with the Divine, the Divine will guide you to your dharma. You don't need to do anything. You don't need to know anything. You are guided continuously to that dharma. Sometimes, something terrible may happen to bring you to that dharma. Sometimes, Grace may bring you to that dharma, but there is this universal Shakti which controls everything, and that's Maha Bhagavati. 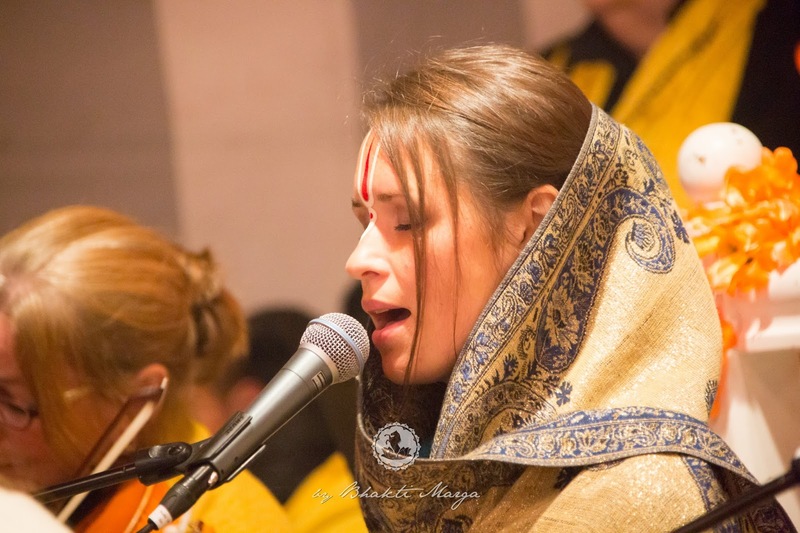 Her aim is to help you to advance to the Feet of Narayana, to the ultimate Realisation. That's why each of the chakras of your etheric body is governed by one form of Divine Mother, one form of Shakti. And when you rise higher up, you have the Sahasrara Chakra, the thousand-petaled lotus, which is upside down. This is the Grace of the Lord which He is pouring upon you every day. However, when you transcend, when you have crossed over these seven lotuses, then you have an open lotus towards someone who is higher. It's Maha Bhagavati's work to bring you so that you can rise and so that you can sit on that lotus. Once you have attained that higher lotus, the Grace ever flows through you. In the whole world, everybody is like a little child and Skanda Mata is reminding us all, “Look I am carrying all of you, but you have to give yourself. If you don't give yourself, how would I carry you?” Like that, Bhagavati reminds us that She holds everybody. God has brought you on the spiritual path – it's not your will to be on this path, but it is your dharma. This Grace is not given to everyone. Often, I remind you that this world has seven billion people. Out of these seven billion, how many people turn out to be spiritual? There are lots of religious people, but very few spiritual people.